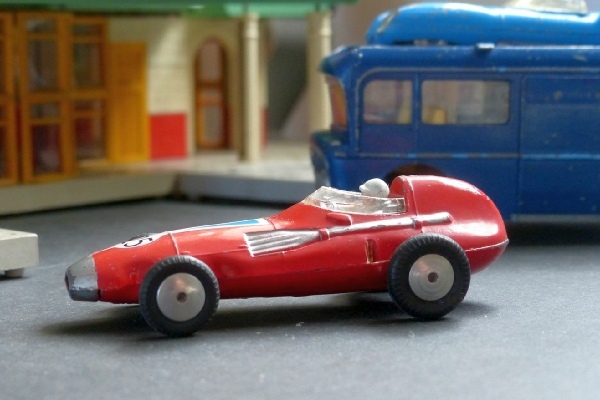 Most of the Corgi range had some appeal for me in one way or another but I have struggled to find anything about the early racing cars. They just looked so basic and lacking in much detail. Maybe there just wasn’t much detail. Anyway, here it is. This is the Vanwall in red with a driver and suspension which was added in 1961. It is also slightly different from the 1957 150, with a silvered nose and the addition of the Vanwall and stripe decals. The older one will have different Racing Numbers, 150S will always be 25. This is in very good condition indeed, with just a little paint loss at the back and front. The wheels are good with the correct size tyres that look original and suspension works well. This is the same one as I am selling in Gift Set 16 with the Ecurie Ecosse Transporter which is where it originated.